3, 2, 1! Switch On! 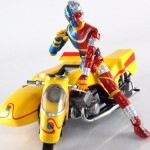 Celebrating creator Shotaro Ishinomori’s 80th anniversary, Premium Bandai have revealed what is perhaps the definitive Kikaider statue – Ultimate Article Kikaider! Standing roughly 40cm high, this static figure is a highly detailed replica of the suit seen on the original 1972 show – complete with intricate detail on Kikaider’s exposed mechanics as well as perfectly capturing his iconic red and blue colourscheme. The statue also features light-up brain and eyes, as well as alternate arm parts to display Kikaider in signature “Denji End” finishing move pose. Unfortunately this statue isn’t for the faint of heart, releasing in July for a whopping 27,000 yen. Though a Premium Bandai exclusive release, the figure is also curiously being released exclusively through Amiami – with preorders on both sites opening tomorrow. Is your wallet deep enough for this to join your tokusatsu collection? Either way, be sure to check out the full image gallery of this incredible figure after the jump! TokuNation is back with the finale (for now) of it’s classic Showa Kikaider galleries! Kikaider 01 is finally complete with the S.H. Figuarts Double Machine! Kikaider 01’s Double Machine is the successor to his brother the original Kikaiders’ Side Machine. A beast of a vehicle, the Double Machine dwarfs it’s predecessor and many other Figuarts bikes. It’s a big, beautifully sculpted and lavishly painted ride that will fit in perfectly with any Kiakider collection. So far the Double Machine is the final Kikaider release from Bandai in the S.H. 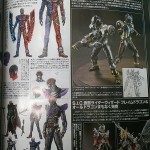 Figuarts line but a number of other prototypes, primarily for Kikaider Reboot, have been shown off previously. So there is some hope that the line isn’t dead yet. But for now this is a magnificent send off for Kikaider fans. We’re back, with yet another figure from a toku classic! We’ve slowly been working our way through S.H. 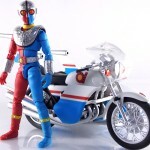 Figuarts released from the Kikaider franchise, and today we’re taking a look at yet another. Kikaider 01’s titular hero, S.H. Figuarts Kikaider 01! Kikaider 01, Ichiro, is the older brother of the original Kikaider Jiro. Dr. Komyoji’s original prototype, 01 is a bit more emotional as his conscience circuit was actually completed. He’s also unique in that he was solar powered. The figuart sets itself apart from the first Kikaider by actually being a well made toy. Seriously, Kikaider 01 is a vast improvement over Kikaider with some solid articulation & much better QC. Overall it’s just a much better release and shows that Bandai finally found their footing with this subline. We’ve attached a selection of images to this post but check out a full 40 image gallery as well as a complete review after the jump! And check in with us next time as we take a look at another classic from the Kikaider franchise with Kikaider 01’s nemesis, S.H. Figuarts Gill Hakaider! The Super Imaginative Chogokin line returns to it’s roots with a brand new edition of the classic Shotaro Ishinomori hero, Kikaider! Before the line started tackling Kamen Rider, it was to the cast of the Android Kikaider franchise and now the hero is getting a modern update over 15 years later. Kikaider comes packaged with a selection of alternate hands and a pair of “Denji End” finishing move effect parts. A Tamashii web exclusive release due in October, Kikaider will cost 7344 yen. Click on to see more images of this fantastic looking figure! › Companies: Tamashii Nations, Bandai of Japan › Characters: Kikaider › Toyline: S.I.C. In the last drop of Figure Oh Magazine scans, it was revealed that a brand new take on S.I.C Kikaider and Hakaider were both in the works, with official line art having been previewed. S.I.C. 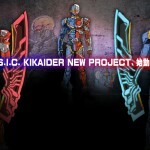 Kikaider at least might be coming out sooner than we think with a new Bandai teaser image having been released. Giving us a much clearer look at what the finished design should end up looking like. At the moment, there’s not that much info to go on but stay tuned and we’ll keep you up to date as more becomes available. S.H. 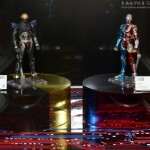 Figuarts Kikaider’s Side Machine Gallery – Toku Toy Box Entry! It’s only appropriate that after a day of new reveals and in hand images for upcoming Kikaider releases, that TokuNation brings you a gallery of the latest release in the line, S.H. Figuarts Side Machine! Side Machine is the personal ride of the original Kikaider himself. An outstanding bike with a side car, Side Machine was way ahead of it’s time for rocking vehicle designs in tokusatsu during the 70’s. Seeing as it’s based on the real world Kawasaki GT 500 Mach III bike, Side Machine happens to include a set of officially licensed Kawasaki decals to accessorize it! This is just an added bonus for a vehicle that sets itself apart by leaps and bounds from most S.H. Figuarts vehicles. Seriously this is one of the nicest bikes in the entire line, gorgeous details, crisp paint, and did I mention those decals?! But don’t just take my word for it, check out 30 images of this awesome ride after the jump. Also be sure to leave a comment in this thread as well. Posting in the S.H. Figuarts Side Machine Gallery thread will automatically enter you for a chance to win one of our Toku Toy Box Giveaway Prize Packs! Specifically you’ll be entered in for our Monolithic Monsters Prize Pack with this one. For full details on entry & Prize Pack breakdowns for Toku Toy Box follow this link. And Best of luck to all! We’ll have another gallery up for entries later this week! TokuNation returns with a brand new photo gallery of one of the most classic tokusatsu heroes out there, S.H. 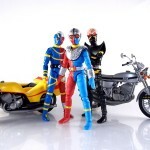 Figuarts Kikaider! 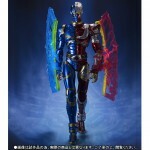 Recently released as a Tamashii Web Exclusive Kiakider is the titular hero of Jinzo Ningen Kikaider (Android Kikaider) from 1972. Created by the late Shotaro Ishinimori, Kikaider was his first live action Tokusatsu hero since Kamen Rider. And in a legacy that includes Kamen Rider & Himitsu Sentai Goranger, some of the lesser known heroes like Kikaider might be looked over from time to time. But Tamashii Nations has stepped up to the plate to deliver this figure. Based on his TV appearance, S.H. 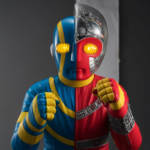 Figuarts Kikaider captures the intricate detail and robotic nature of the on screen character. Though it lacks a bit in the accessory department the figure has some personality to it that classic toku fans will latch onto. With the recently released Hakaider and the upcoming Kikaider 01 as well, the Kikader family is slowly growing in the S.H. Figuarts line. Check out our full gallery of this awesome figure after the jump by clicking “Discuss on the TokuNation Forums” at the bottom of this post.